Gabrielle Hazen attempts a block. 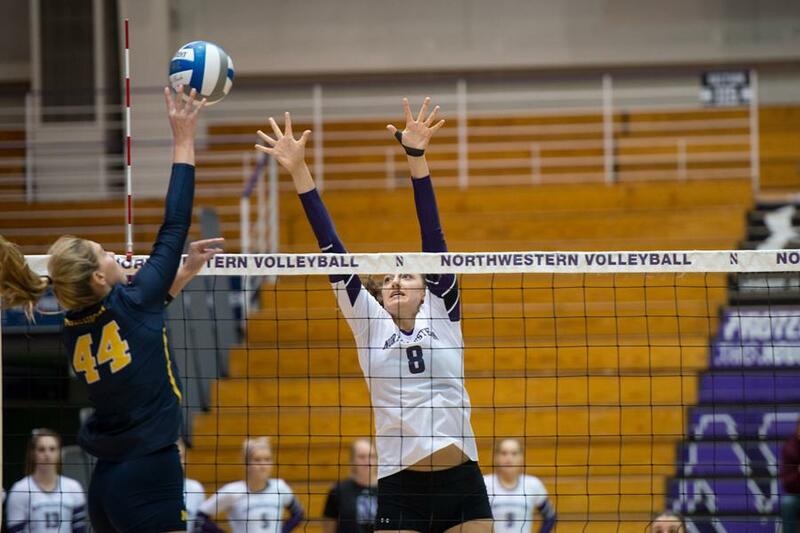 The junior middle blocker had three kills as Northwestern slumped to a sweep at the hands of No. 24 Illinois. On the one hand, the 22 points Northwestern scored in the third set Saturday night were the most it has scored in a set in five matches. On the other, sets are played to 25. The Wildcats (7-13, 0-8 Big Ten) lost in straight sets to No. 24 Illinois (13-6, 6-2 Big Ten) 25-11, 25-15, 25-22. The Fighting Illini were all over NU early and had complete control until the final set, when Coach Shane Davis made some lineup changes. Freshman Sarah Johnson came into the game at libero to replace senior Rafae Strobos, who started in place of injured sophomore Katie Kniep. Davis said he still doesn’t know if or when Kniep will be able to return this season. Freshman outside hitter Allie Lindroth also joined the lineup in the third set, and she ended with four kills. Junior setter Taylor Tashima said she liked the way the new faces played. The Cats were led by junior outside hitter Symone Abbott, although the Big Ten’s third-leading hitter by kills-per-set finished with just seven kills. Senior middle blocker Maddie Slater was next with five, but Illinois had three players with at least seven, including junior outside hitter Michelle Strizak, who finished with a match-high nine. Passing issues plagued NU all night, as Tashima had trouble integrating everyone into the offense. Johnson finished with 14 digs to lead the way for the Cats, while Strobos had 13. NU had issues hitting around the Fighting Illini’s front line, as Illinois finished with 13 blocks to the Cats’ five. Abbott ended with 44 attempts, more than double the amount of anyone else for NU. She finished with a .045 hitting percentage, below her average of .195 on the season. Despite her struggles, Abbott still figures to see a majority of the hitting chances going forward, as Tashima said it’s hard to set the middles when the passing isn’t there. After yet another Big Ten loss, Tashima said the team isn’t panicking.